Lately, I have been painting my nails almost every few days. A little obsessed? Definitely. For someone that constantly wants to dye her hair or completely change her style day-to-day, this is the perfect alternative. One of my favorite places to go for nail-spiration is my friend Ally’s blog, Nail in the Coffee. She is always coming up with wonderfully unique nail designs, like her popular Beer Bottle Nails or her 24 Karat Gold Manicure (we’re talking real 24 karat gold, ladies). To this day, I aspire to master her Galaxy Nails. 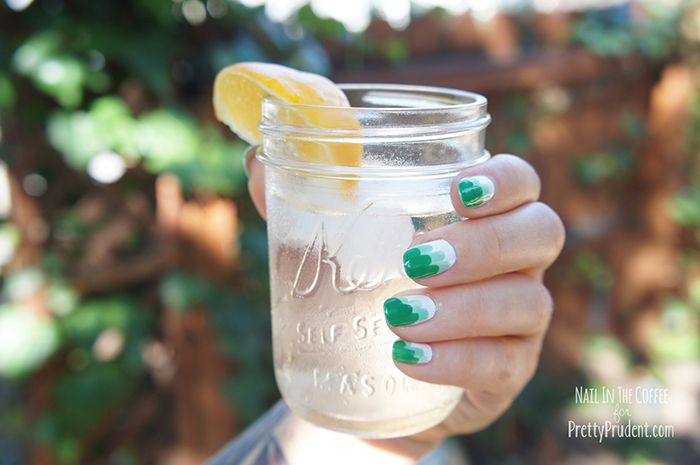 We are very excited to share that Ally will be posting more nail tutorials on Pretty Prudent, starting with this easy-peasy Springing into Summer Nail Art Tutorial. Grab your friends and try them out! 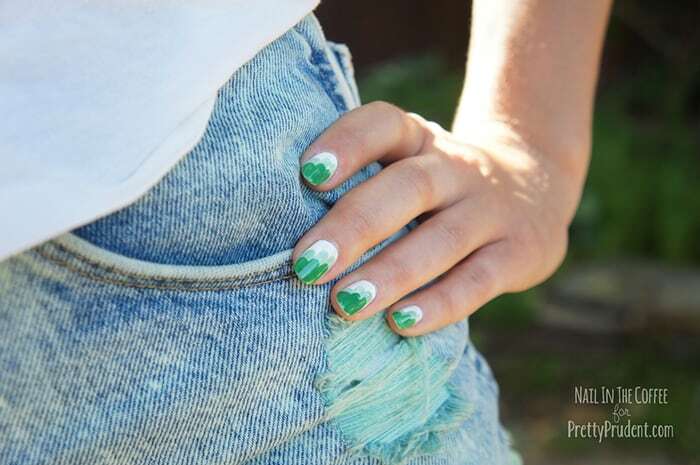 Over the first real hot weekend of LA’s encroaching summer, it’s only appropriate to do some nail art that launches us from spring right into summer. 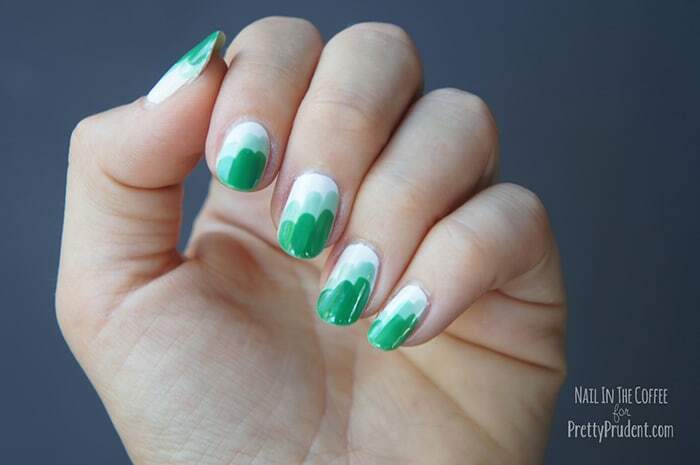 I’m thrilled to be posting on Pretty Prudent, and I really hope you try out, and enjoy this simple yet impressive nail art! Step 2. Using the width of the nail polish brush, create a line, down one side of your nail to the tip with a soft turquoise. Start about halfway up for this first line, to leave plenty of room for the rest. Step 3. With the same color, create a second line down the middle of your nail, alongside the first, but this time start a little higher; I split the difference between halfway and my nailbed. Step 4. Create a third line down the far side of your nail, starting almost at the nailbed, all the way to the tip. Step 5. 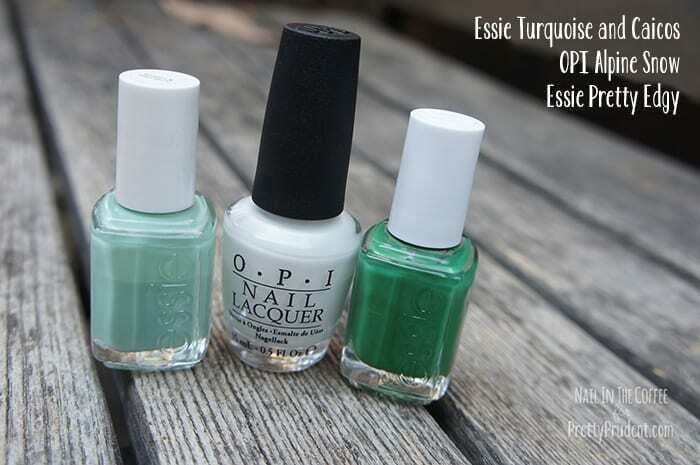 Using a fresh green color, repeat Step 2., but this time start closer to the tip of your nail, so you have a nice bit of the turquoise peeking out. Step 6. Create a stripe down the middle of your nail, mimicking the shape we created in Steps 1-3, but in green, and further down the nail. Step 7. Finish with one last line of green down the far side of your nail. Add a quick dry topcat, and voila! I call them ruffles, my boyfriend calls them “Mario Trees”, but I think we can all agree to call them pretty adorable! This mani looks fantastic in any hue, so go ahead, pick two in your favorite, and give it a try! I can’t wait to show you some more fun, easy nail art! Its just an amazing idea for DIY nail art. I guess it will take just 5 minutes for complete nail art. I love this idea! Such an original look!